Walt Disney had a few successes with sequels, even though he generally didn't believe in them. Davy Crockett and the River Pirates and Son of Flubber made a lot of money at the box office and proved that sequels were too lucrative to pass up. However, Old Yeller made in 1957 had to have seemed like an odd choice six years later, with one of its child stars now an official adult and the titular character having died at the end of that film. At any rate, Old Yeller author Fred Gipson wrote a follow up book and Disney made a decision to adapt it to the screen. Norman Tokar was hired to direct his second Disney film after making Big Red. Author Fred Gipson and William Tunberg adapted the screenplay, the same way they did for Old Yeller. Three of the original principal cast returned including Tommy Kirk, Kevin Corcoran and Jeff York. This was York's last Disney film, although he did appear in the TV serial Daniel Boone in 1966. Neither of the parents, Dorothy McGuire or Fess Parker, returned and in their place, Brian Keith from Ten Who Dared and The Parent Trap took the role of Uncle Beck. The character Lisbeth was recast with actress Marta Kristen. This was her only Disney film. Terry Gilkyson wrote one song for the film called "Savage Sam and Me." He previously wrote a song for Swiss Family Robinson and would go on to write "The Bare Necessities" from The Jungle Book. The film opens a lot like Old Yeller with footage of Sam instead of Yeller running around the farm as the credits and "Savage Sam and Me" play. Travis and Arliss are taking care of the farm while their parents are out of town. Sam causes a lot of mischief for Arliss while doing the chores, which gets him and Travis in a fight. Uncle Beck arrives just in time to break it up. Bud Searcy and his daughter Lisbeth show up and tell Travis that some Indians are terrorizing the settlers. When Travis, Arliss and Lisbeth go chasing after Sam into the mountains, they are taken captive by Indians. Savage Sam is attacked during the fight and they assume he is dead. The Indians make Arliss one of their own and plan to make Lisbeth a bride and Travis a slave. Travis is able to escape during a fight and Savage Sam finds him. They run into Uncle Beck and Bud who have formed a rescue mission. They successful rescue Arliss and Lisbeth and return home. The film ends with Savage Sam running off to chase after a young bobcat as a reprise of "Savage Sam and Me." 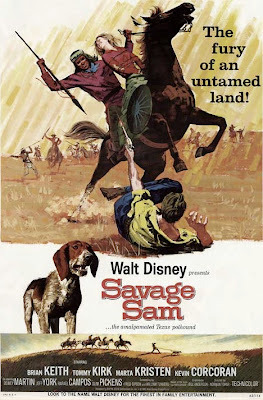 Savage Sam was released on June 1st, 1963. Critics were fairly mixed. While many admitted that it was a typical Disney western film, others saw bigger problems. The biggest criticisms were that the comedy bits didn't fit in a story that was at times very intense, making them feel pointless. It was not a success at the box office, possibly because Disney didn't attempt to link it to Old Yeller in any of the marketing. It was first shown on TV in 1966 and was released on home video in 1986. The plot of this film reads well on paper and must have seemed very exciting before it was filmed. However, the transition to the screen is not as graceful. The film has many slow points where the story comes to a stop and while concern for safety of the three captives could have been intense, they are handled in a light way, so the audience never truly feels they are in real danger. Tommy Kirk makes the transition to a more mature role with a lot of charm, but Arliss should have been written older for Kevin Corocoran. Half the lines they give him seem awkward coming from someone whose voice is changing. It's not a bad film by any means, but its fairly mediocre, especially when considering this is a sequel to one of the greatest dog films ever made. Like most Westerns from this era, the Native Americans are represented as being somewhat savage and therefore might be offensive to anyone of Native American descent. Savage Sam is currently available on DVD in a combo pack with Old Yeller, where it is compressed onto the same disc as that film. A standalone release from 2004 gave the film its own disc, but is now out of print. Both releases present the film in fullscreen, but its original theatrical aspect ratio would have been widescreen, most likely 1.75:1. It is available in widescreen on iTunes, where it can also be purchased in HD.